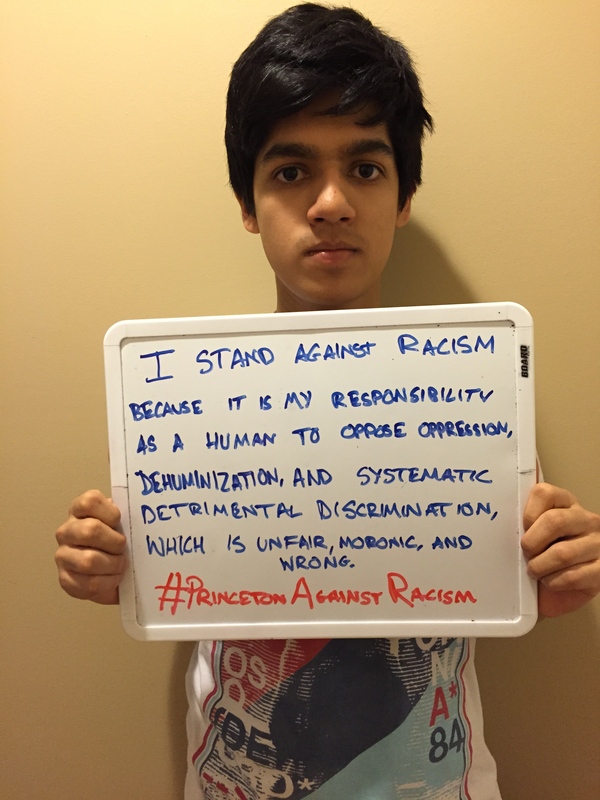 Ziad Ahmed, redefy founder, declaring why he stands against racism through redefy’s #PrincetonAgainstRacism campaign. When I began this project I did not know what to expect. I did a photo campaign about a month ago in recognition of Everyone Matters Day and asked people to finish the phrase “I am…” with the purpose of celebrating diversity and embracing individuality. I took over 50 portraits in my #IAM campaign for Everyone Matters, but I knew this project would be significantly harder, more provoking, more controversial, and more rewarding. I went around my school for two days and I asked people the question, “why do you stand against racism?” The reactions were extremely varied. I was overwhelmed by the willingness of certain individuals to articulate their thoughts, and I was disheartened at the dismissal of the idea by others. When you go through the photos it is easy to be unimpressed by the reoccurring mundane comments such as, “Racism is bad,” but through my journey I have discovered the importance of those responses. I asked people to give their authentic reaction to the prompts. I requested of my peers and teachers to think about why they stood against racism, put it into words, and share it with the world. I wanted to see people’s honest reactions as to why they stood against racism. The fact that so many people instantly associated racism with something that was bad is a beautiful thing. It is unrealistic to expect people to be able to immediately come up with a powerful remark. It is unfair to expect that everyone is aware of the extremity of racism. In an ideal world I wish that everyone could retort to the prompt with words so compelling that they send chills down my spine, but I choose to accept my reality and attempted to better it. In our reality and specifically in my reality of Princeton, New Jersey, I find it so imperative for people to recognize the disgusting nature of racism. It warms my heart that I live in a place where it would be unheard of for someone to announce their support for racism, but it breaks my heart that racism still exists within my school walls through micro-aggressions, ignorance, racial epithets, and an unwillingness to discuss racism. It breaks my heart to know that racism exists through out my nation and the world in a very real way. It is ludicrous to me to think that people could possibly believe the color of one’s skin could say anything about them. It is moronic, gross, and insanely unjust of people to belittle, discriminate, and judge people based on the pigment of people’s skin. I could go on forever about why I stand against racism and reiterate my opposition to prejudice in a million different ways, but it is necessary to evaluate the fact that I am a minority, I have been exposed to an abundance of information, and I identify as an activist. I wish for a world where everyone identifies as an activist, and I am hoping redefy and my work can inspire and foster activism within my community and particularly within teens. When I asked people why they stood against racism I was met with a lot of people not being able to form their words on the spot, but overwhelmingly with an attitude which condemned racism completely. I think it is easy to look through the pictures and want to see more. I think it is easy to demand eloquent articulation, but I think the beauty lies in the sentiment of the project and simplicity of the words. We did not receive perfect responses, and we did not censor the participants. We have chosen to feature those who were brave enough to participate in our campaign and declare their stance against racism and for that I am thankful. In a year from now I would love to be able to do this campaign again and take more portraits and engage in more meaningful discussions as a result, but ultimately I am incredibly happy with the results of this project. I live in a predominantly white community where many people do not easily discuss race and that is a problem I am trying to address. Through our #PrincetonAgainstRacism campaign we demonstrated that our town will not tolerate intolerance, we started a conversation, we initiated a thought process, we furthered our collective conviction to equality, and we banded together to do something beautiful. I am so incredibly proud to attend Princeton Day School and to be a Princetonian. I am so thankful to all those who have participated, helped out, remained involved, and taken the time to view the pictures. The pictures were taken at Princeton Day School and at Communiversity, and all views expressed do not express the views of our organization, but rather represent our community’s outlook. #PrincetonAgainstRacism was a campaign by redefy, Princeton CHOOSE, and Not in Our Town – Princeton in order for the inhabitants of our community to have the opportunity to discuss race, advocate for acceptance, and display their stance against racism. The campaign was in participation of the YWCA USA’s Stand Against Racism Campaign. I engaged in countless powerful discussions as a result of this project. I have learned so much about my classmates, school, town, and society as a result of this project, and I can truly say that it has made me a better person. Racism is an evil we cannot tolerate. Racism is an evil we must educate ourselves about in order to effect change. Racism is an evil I encourage you all to join me in fighting. We cannot forget the murders of Michael Brown, Eric Garner, Phillip White, Eric Harris, Justus Howell, Freddie Gray and unfortunately so many others. We cannot turn a blind eye to the injustices around us. We must be conscious of the systematic racism which is disgustingly prevalent in our nation and world. We must stand against racism today and everyday. I stand againt racism because it is my responsibility as a human to oppose oppression, dehumanization, and systematic detrimental discrimination, which is unfair, moronic, and wrong. I stand againt racism because equality is a necessity. I stand against racism because the color of one’s skin should not dictate the length of one’s life expectancy. I stand against racism because I refuse to turn a blind eye to the injustices around me. I stand against racism because I refuse to be ashamed of the pigment of my skin. I look forward to standing against racism with you. Prev Todd Mack on May 12th!